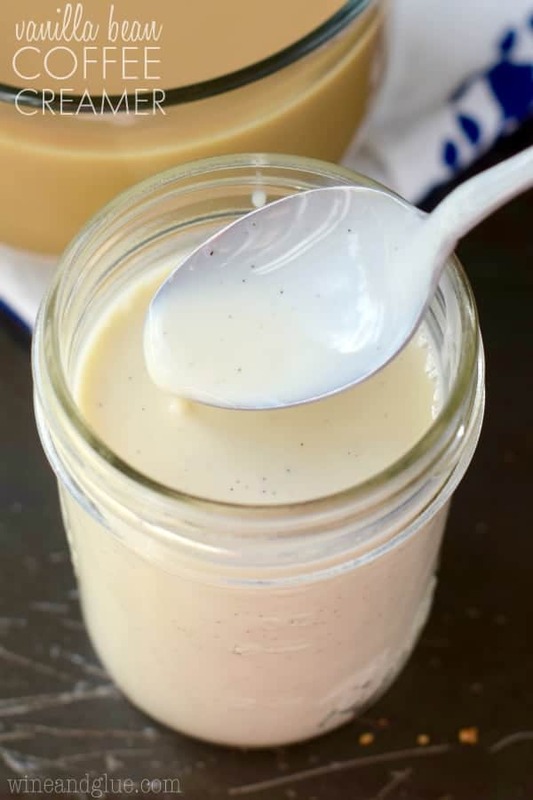 This Vanilla Bean Coffee Creamer could not be easier to throw together, but it is such a fun treat for your morning coffee. 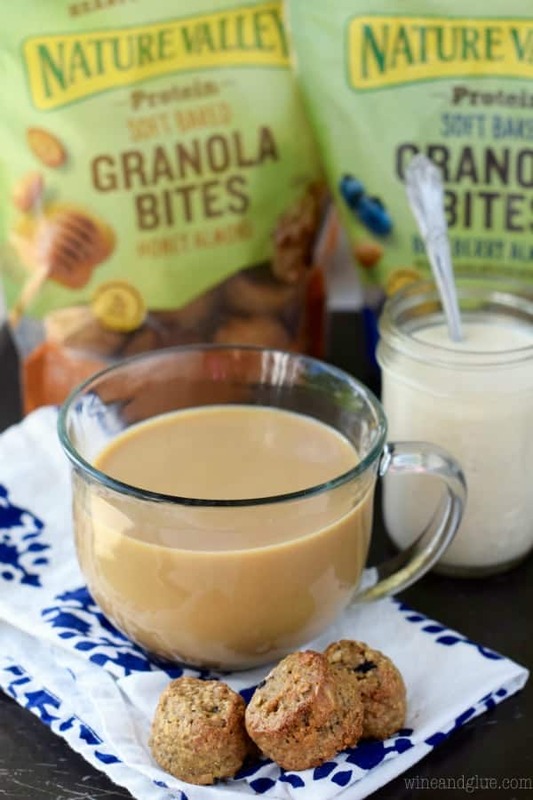 Pairs perfectly with Nature Valley™ Protein Soft Baked Granola Bites. Thanks Nature Valley for partnering with me for this delicious morning post! How was your weekend? Mine was good, but BUSY! It is, unfortunately, coming to our attention that we need to act like adults. (WHOMP WHOMP) And when you are adults you can’t just play all weekend. You have to do nonsense. Like laundry. Unfortunately, in addition to having to act like an adult, when you have kids, you have to make them act like adults. (I know that sounded confusing, but stick with me.) We had the conversation this weekend about how we really should make our kids put their shoes away and not allow them to leave chapstick uncapped under dressers because no one wants a 27 year old who leaves chapstick everywhere. Thank goodness for my husband who took one for the team and cleaned the rooms of BOTH big kids with them. Seriously, walking in their rooms made my head want to explode. And the thought of standing in there with them and cleaning?? . . . I can’t even. Guess what else makes life easier? 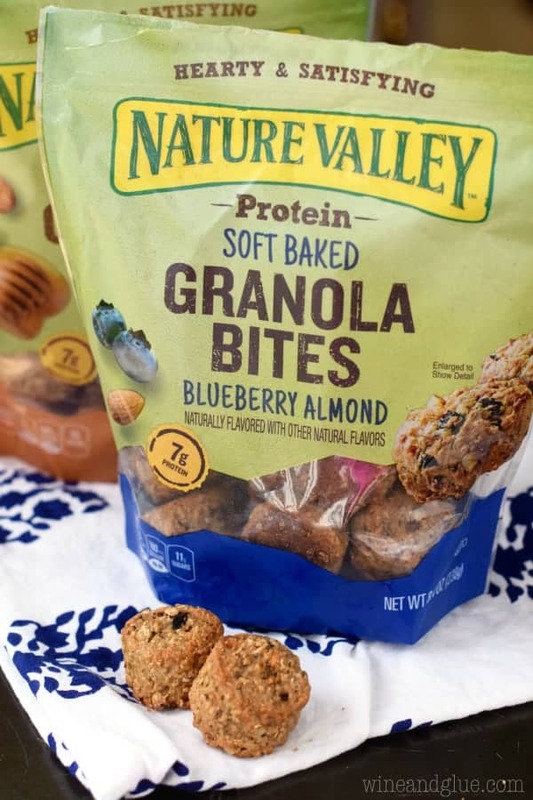 These Nature Valley Granola Bites! 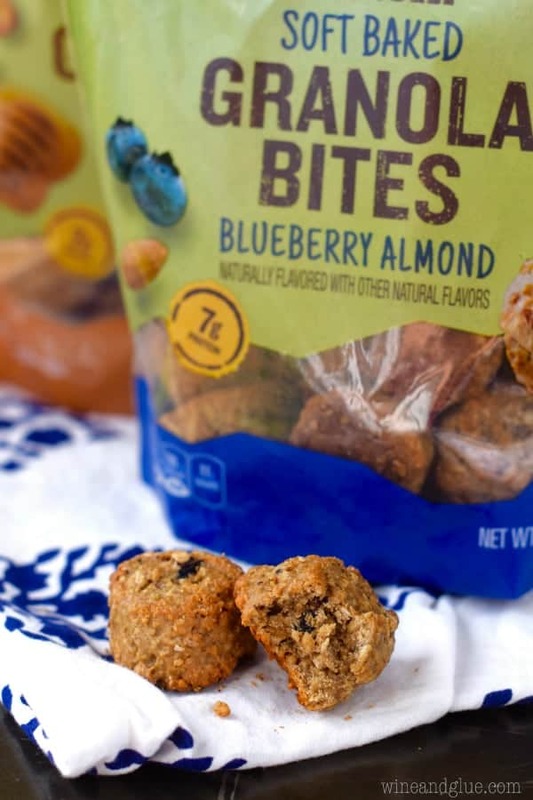 I absolutely love snacks that I feel good about giving to my kids because they are high in fiber and packed with protein. Plus, these are soft, so even my littlest kiddo with her lack of teeth can dig into these! Seven grams of protein, zero trans fat, no artificial flavors, and no high fructose corn syrup! Winning. Plus they are super delicious! I love these for a fast breakfast! And they come in Honey Almond and Blueberry Almond! 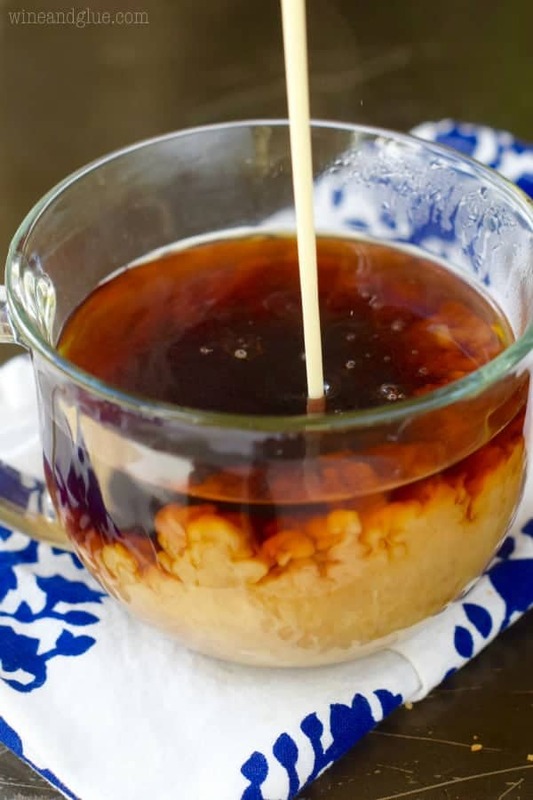 And then you pair them with some coffee and this super simple to make homemade Vanilla Bean Coffee Creamer and your day is made. Make sure to follow Nature Valley on social media though Facebook, Twitter, and Instagram! This coffee creamer comes together so fast with just a few ingredients. And it makes your coffee feel like a dessert. Because I don’t love giving all my money over for a few vanilla beans, I made this with vanilla bean paste. Super handy and you can find it at stores like TJ Maxx for about $5 a bottle. So fun! Store in the refrigerator and shake before use. Yuuum!!!!!! I am so in love with vanilla bean paste right now, and of course I can’t live without my morning coffee. Trying this one for sure! Nagging my kids to clean up just winds up with me screeching my head off while they just look at me like I’ve lost my mind. My husband has to do clean up time. It’s torture. Which this creamer is not. This creamer is heaven. I want it in everything! Where do you get vanilla bean paste? I like to look for it at stores like TJ Maxx, because you can usually find it for less there. But you can also get it on Amazon. When I was growing up we drank condensed milk in everything… coffee, teas etc. We even added it to snow cones/snow balls. This is so interesting as I can think of sooo many delicious options for this combination. I love vanilla and I love condensed milk for the memories. Thanks for sharing, definitely going to try this one. What a great idea! Would it still come together smoothly with condensed milk? Any idea how long its good for? Thanks in advance. Wow! That’s it? It is really super simple to make! My friend has always been going on about me trying out the homemade Vanilla Bean Coffee Creamer and I have always been pushing it off because frankly, I felt it would be difficult and time-consuming. But this recipe here has me thinking otherwise and honestly, my day is made! Really can’t wait to surprise my friend this weekend!